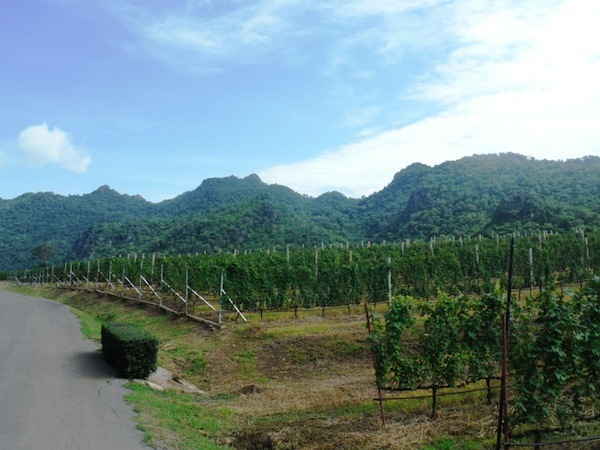 While I am working on more detailed posts about my visit to GranMonte winery in Thailand last August, why don’t you go and check out a small appetizer I just got published on Palate Press about it yesterday. There will be more about the winery on this blog, but this should give you a first idea. Interesting. I can’t recall a single local wine when I was in Thailand just three years ago and I do enjoy pairing wine with Thai food (did so on Sunday night in fact). This would have been fun. It really is still a developing industry, and Thailand being much more of a beer and liquor country, it will likely remain so for a while. I hope you get a chance to go one of these days, because it really is beautiful up there. Congratulations and thanks for introducing me to Palate Press, very cool! I loved the article, the story (even your image shows how passionate Nikki must be!) and your tasting notes. Thai wine: that’s something worth trying! Thank you so much, Stefano. As I said, I plan on writing in more depth soon…it was quite the trip! Big pat on the back for getting published! Oh, and that calls for me to have one extra glass of wine (riesling, of course) in your honor this evening! Thanks buddy!! :) Enjoy that extra glass….I’ll pour myself some as well! I think that getting published is an entrepreneurial thing to do! Hahahahaha, yes, that is so wonderfully true. The ever confusing divide between self-perception and others’ perceptions and add different ideas and definitions to the mix….and it gets wonderfully entertaining!! Thank you, Tracy, as always and on this one in particular!